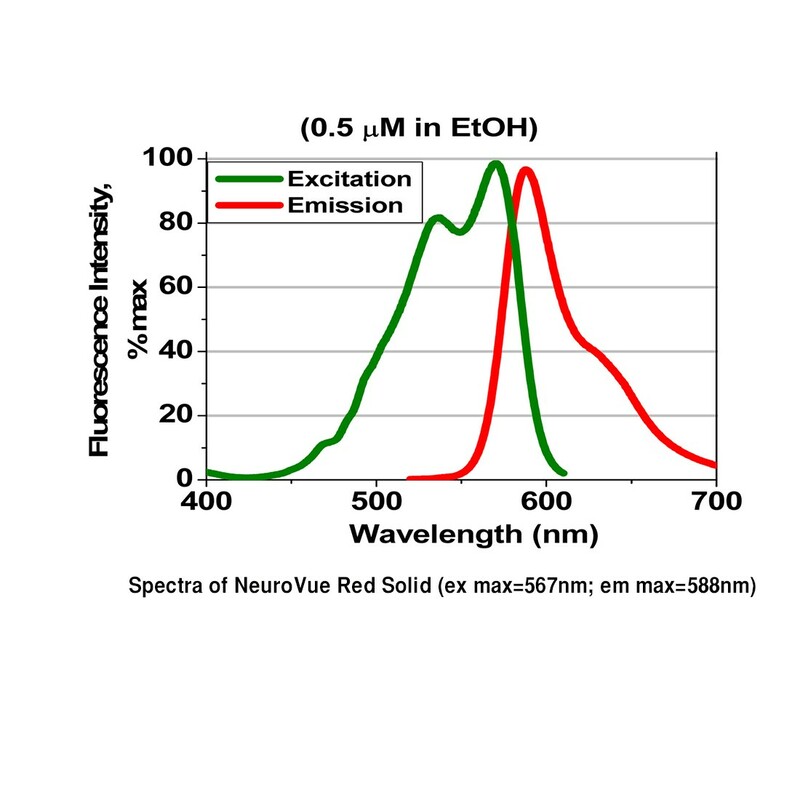 NeuroVue® Red Solid can be formulated as desired for applications in which the filter format is not suitable. NeuroVue® Red Solid is useful for neuronal tract tracing studies of up to 3-4 weeks. Spectrally compatible with eGFP, YFP in many systems, and NeuroVue® Maroon & Jade. Spectral unmixing required for use with NeuroVue® Orange. NeuroVue® Red Solid is available in solid form for researchers who would like to make their own dye-coated materials for application to tissue (e.g. use for coating glass/metal pins or pieces of hair to provide a more rigid support when smaller injections are required). 1 mg of solid dye. NeuroVue® Red has been found to be useful for tracing neuronal connections in animal tissues fixed in formaldehyde (1, 3-6, 8, 10, 12, 13). Like other lipophilic tracers (7, 9), it readily transfers into plasma membranes in fixed and/or live tissues and diffuses laterally within the membrane, eventually labeling the entire cell body as well as the finest axonal and dendritic branches, and allowing visualization of neuronal processes up to several millimeters distant from the point of dye insertion (1, 3-6, 8, 10, 12, 13). NeuroVue Red fluoresces in the red and exhibits minimal bleed through into filter windows typically used for green fluorescing lipophilic tracers such as NeuroVue Jade and far red fluorescing lipophilic tracers such as NeuroVue Maroon or NeuroVue Burgundy, making it an excellent choice for multi-color neural tracing studies in sections and/or whole mount preparations (1, 3-6, 8, 10, 12, 13). In addition, NeuroVue Red can be used in combination with NeuroVue® Orange if spectral unmixing techniques are employed.